STAMFORD — The storied brick movie house on Hope Street was never meant to be — its history a tale of reinvention and adaptation in fiscal crises as the village around it morphed into a part of the city, and its clientele shifted from men in bowler hats to those in fedoras to children sneaking an impromptu matinee. The State Cinema has screened thousands of movies since its projector first flickered light through nitrate film in 1927 for a much-awaited screening of “Tell it to the Marines” after a failed launch as a vaudeville theater. Its last film, now through a digital projector, will hit screens this Labor Day weekend, and the cinema will shutter due to another — this time fatal — dip below the bottom line. The Freedman family, owners of the cinema since the 1970s and operators since 1987, are shutting down the cinema’s two screens after nearly a decade of annual losses. The past four years have been even deeper in the red, said Richard Freedman, manager of the family’s real estate firm, Garden Homes Management. The answer, he said, was reached with great difficulty this spring. In the early days of cinema when the silent art form was just turning to feature narratives, films were often parts of vaudeville shows, which remained a big night-out draw. A slow shift to longer films started taking a toll on old vaudeville, and poached its talent such as Charlie Chaplin, around World War I. But the shows still drew crowds, and a Springdale vaudeville theater seemed a prudent investment, until Al Jolson, in “The Jazz Singer,” broke into song — the same year the theater opened its doors. That film, the first “talkie” couldn’t have come at a worse time for the founders of the theater, led by local builder Ernest Kiesel, according to city land records. The building, with seating for 1,000 and bowling alleys in the basement, was worth between $110,000 and $140,000 — about $1.7 million now, according to “Springdale Remembered,” a book chronicling the neighborhood’s history. Called the “Springdale or “Sterling” Theatre — depending on which historical account you read — the place was a hit with its massive painted ceiling depicting a cloudy day framed by gold-leaf paint. It had a good run until again falling prey to creditors. It was purchased years later, records show, and its name changed to the State Theatre. Oddly, the theater building’s first tenant was someone the Freedmans later learned they knew: Richard’s great-grandfather, Gilbert. In the 1950s, the State was closed for several years and the bowling alley became an ice rink, until that also closed. It is unclear what prompted the closures or when the theater reopened for good. In the ensuing decades, it bounced between owners and operators, each trying to turn a profit to no avail. By the 1970s, the cinema was open but struggling. It was always a second-run theater, known for lower prices than downtown’s first screenings, but attendance waned and the building fell into disrepair. Freedman’s father, Joel, bought the building as an investment in 1976. For the next 10 years, the cinema was operated by a projectionist, who was Joel’s tenant until 1987 when “he up and left, leaving us holding the bag,” Freedman said. Joel Freedman “was faced with tearing the theater down or drastically upgrading its facilities,” according to a 1988 edition of the Stamford Advocate. He chose the latter, sinking $300,000 into the then one-screen movie house. The business worked for the Freedmans for the next seven years, Richard said. Again facing a setback, the family added a second screen, which was tricky because neither Joel nor Richard would ever split the main amphitheater with its historic ceiling. The second theater, tucked behind the main screen on what was the vaudeville stage, opened in 2004. The second screen gave the business a boost, and a year later, lengthy court fights came to fruition for Freedman, who successfully won the right to have a first-run theater. He hoped that would turn things around. But then came another major investment, a switch to digital projection propelled by distributors who didn’t want to pay for film prints. In 2011, Freedman converted the theater to digital and then renovated the lobby in 2015. But the improvements didn’t stave off the inevitable, and 2017 marked a 25-year-low in national movie attendance. And the cinema, far from downtown, with little parking and only two screens, starting losing more money than the Freedmans could sustain. So Labor Day weekend, the State’s main projector will dim for the final time after a screening of “Replicas,” a Keanu Reeves vehicle about a scientist obsessed with bringing family members back to life. The Freedman real-estate firm is now hearing proposals for the space, but one thing is non-negotiable. The family will only entertain proposals that maintain the historic integrity of the main auditorium, he said. Freedman’s firm, which deals mostly in housing, will not put in apartments. 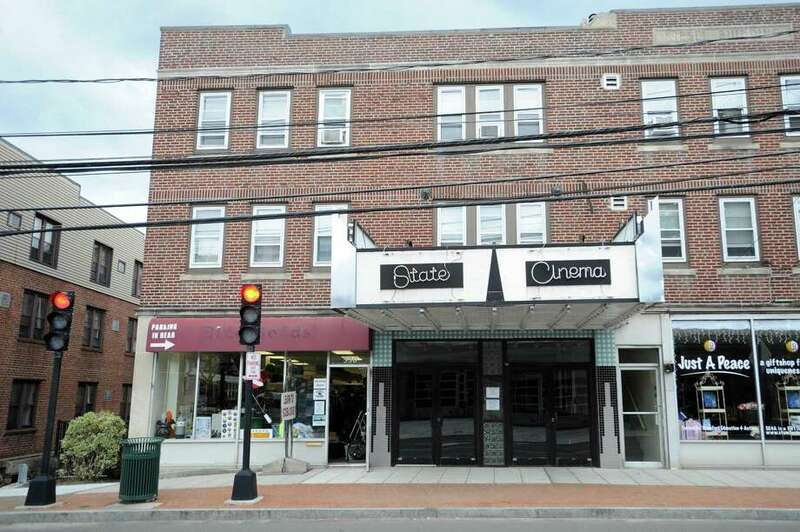 Freedman would prefer it remain a movie theater, but doubts a new owner could make it work. SNA President Chris Reid and Board member Steve Garst with Jim Travers on Hope Street. Stamford transportation chief Jim Travers, left, stands on the east corner of Hope Street near Largo Drive talking to Springdale Neighborhood Association President Chris Reid, center, and Steve Garst, vice president of the association. City transportation planner Jim Travers sized up the Hope Street crosswalk near the Springdale train station last week and suggested new flashing lights and realignment could improve pedestrian safety. Travers said he came to the spot to meet Spring-dale Neighborhood Association President Chris Reid and Vice President Steve Garst to develop safety improvements after two men were struck by a truck in the crosswalk last month. Travers said he plans to install rapid rectangular flashing beacons on both sides of the street to alert motorists of the crosswalk. He is also considering adding a section of sidewalk near the crosswalk to eliminate an area where cars usually idle while waiting to pick up commuters. Travers said cars in this spot block the view of pedestrians crossing the street. Travers said he wants to have a badly eroded crosswalk at Hope Street and Largo Drive repainted. During his visit, several commuters crossed during evening rush hour traffic on Hope Street outside of a crosswalk on the northern side of Largo Drive. “There are maybe a couple of other things we can do, but first we want to highlight they should be in the crosswalk,” Travers said. The two men who were struck told police they entered the crosswalk before they saw a northbound truck speed by them. Moments later, they were struck by a GMC pickup truck driving in the opposite direction. 16, 2016 — Trial street garden 12 – 8 pm. Carroll St between Knapp/Mulberry. View the article in the Advocate about this event! Fontneau and Capt. Sue Bretthauer met with about 30 Springdale and Glenbrook residents Wednesday night at Twin Rinks to discuss the recent surge in car burglaries and crime in the area. There were 63 reported car burglaries — [all but 3] of unlocked vehicles — in Springdale between Sept. 16 and March 6. View the rest of the article in the Advocate . SPRINGDALE—Brenda Cerezo is among the business owners concerned about the density of commercial and residential development making Hope Street less accessible to customers. Parts of the project, which included widening Hope Street, have damaged parts of the sidewalk, according to the owner of Cerezo Salon at 1091 Hope St.
Springdale merchants plan to discuss the area’s business climate at the next Springdale Neighborhood Association’s meeting at 6:45 p.m. Thursday at the Weed Memorial & Hollander Branch at 1143 Hope St.
Thomas Madden, Stamford’s director of economic development, is expected to lead a discussion on small business in Springdale and speak about new economic development initiatives in the city. Springdale Neighborhood Association President Christine Reid said SNA invited Madden because the association is trying to be more supportive of small businesses in the neighborhood. Reid said there are many businesses operating out of homes and non-storefronts that need help promoting themselves. “There are many more businesses than meet the eye and I would like to help businesses and customers find each other so more people — and businesses — can get their supplies and services from other Springdale sources,” Reid said. STAMFORD — A Springdale public improvement project, a decade in the making, is nearing its completion. City officials held a dedication ceremony on Wednesday for the Hope Street Improvement Project at State Cinema in Springdale. The $4.2 million project, which began construction in April, aims to improve safety for pedestrians and motor vehicles in a highly trafficked area. The project spans nearly a half-mile on Hope Street between Northill Street and Weed Hill Avenue. The improvements will primarily provide road widening and sidewalk installations along the route. The project route includes eight intersecting side streets, many of which will be enhanced with through lanes and turning lanes. To further ease traffic congestion, turn lanes will be added going into Springdale Elementary School. “There’s a lot of complexity to it. There’s intersections that have traffic signal replacements, new sidewalks and drainage improvements,” said City Engineer Louis Casolo. To improve the street appearance, the area between the curb line and sidewalk will be constructed with brick pavers. The sidewalk will be reconstructed on both sides of Hope Street and Camp Street and a new sidewalk will be provided on the north side of Greenway Street, according to city officials. Safety improvements include addition of granite stone curbing throughout the project to better define the travel way and to protect pedestrians. The project is about 90 percent complete and is expected to be finished by August 2014, according to Casolo. Prior to construction, the city coordinated with several utility companies to complete underground work in preparation of the project. The city worked with AT&T, Verizon, CL&P and Yankee Gas to relocate services before construction. “Disruptions to utility services were minimal and usually took place early morning or late at night,” said Michael Rosenblatt, a Department of Transportation engineer, who managed the day-to-day operations of the project. Despite the construction, traffic was kept to a minimum as well. “It is quite difficult with the amount of traffic this area gets, especially with the school right up the street, said Rosenblatt. The improvements were funded through federal, state and local governments. City Rep. Mary Fedeli, who represents the Springdale district, said the project received initial funding for road widening when a post office was added 10 years ago. City officials credited city Traffic Engineer Mani Poola in securing most of the project’s funding. New trees are expected to be added during Spring. A plaque commemorating the project will be mounted on the corner of Northill and Hope Streets. The Springdale Neighborhood Association, along with Fedeli, was pivotal in bringing the need for the project to the city’s attention. “The reason we became involved is because our responsibilities are safety and beautification, said Jennifer McKeon, president of Springdale Neighborhood Association. “It was very long-term but this is a happy ending to this project,” added Phyllis Pugliesi, a neighborhood association member. Springdale Feature in the New York Times. Check out the 7/30/2013 article on Springdale in the NY Times.